If you’re tired of nagging them to tidy up, read on for our age-by-age guide to (gently) urging them to help out. Like most things in life, there’s an age and stage for everything, including helping out around the house. Obviously you don’t want to be a nag when you spend time with your grandkids and you can’t ask a four year old to take out the garbage; just like you can’t expect a teenager to remember to pick up his socks (hardly). That’s why there’s the “10-Minute Tidy”. And it pretty much works for kids of all ages. “Play music and set a timer,” suggests Bonnie Joy Dewkett, a certified professional organizer. “Everyone scurries to clean up (or put away) as much as possible and it becomes a fun few minutes, too.” That’s just one way to get your grandkids to find the fun in cleaning up. Read on for more. 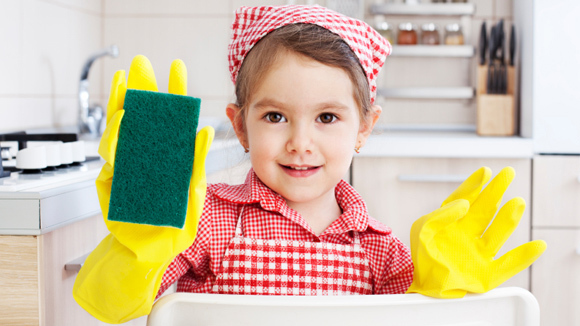 Tip: Other jobs a child this age can do: Dust with a feather duster, collect dirty clothes. By this age, your grandchild is more than up to the task of sweeping, collecting newspapers to be recycled, setting the table, and getting the mail, suggests Dewkett. Kids at this age are also often motivated by earning rewards for doing tasks above and beyond. “Perhaps this means you offer a child $1 a day to walk and feed the dog, clear dirty dishes after dinner, or help dad wash the car,” Walfish says. If you want to avoid giving them cash, reward each task by putting money into a fund for new sports gear or new apps for the iPad. You can count on your grandchild to do everything from make a simple meal, like PB&J (and clean up afterwards), to wash their clothes and mop the floors. They should also be feeling a sense of pride in keeping their room neat and their belongings in great shape. Tip: Kids this age want choices—and order. “Anything that will give them the opportunity to choose how they will help or how things will be organized motivates them to keep it up,” says Hoppe. At this point, your grandchild should be able (and up for) cleaning the bathrooms, mowing the yard, and helping make dinner. “It’s a critical time to reward adolescents with earned freedom,” Walfish says. “Explain that when they demonstrate personal responsibility, they are showing that they are ready for more TV or electronics time, later curfew on Saturday, extended bedtime or, even, borrowing your car.” All of which means this cleaning has helped your grandchild develop and grow. “After all, self-reliance is a prerequisite to independence and becoming responsible,” Walfish adds. Pass the Swiffer.